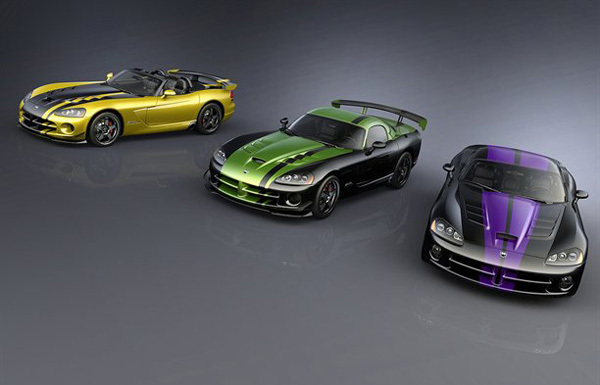 Dodge introduced three Viper supercar limited editions, devoted to its dealers with the best results. The American manufacturer will produce only 50 units of this limited editions, each one individualized by their body colors. The production of the Dodge Viper supercar is nearing the end and the American manufacturer promises a pleasant surprise for the dealers with the best results. Dodge officially announced that it will create three special edition of the sports model, one for each U.S. dealers who sold the most Viper units over time. Chrysler subsidiary will produce three limited editions of only 50 copies, a number that will ensure an exclusive character of the model that is near retire. Viper’s production will total about 500 units this year, the end of 2010 will bring a complete stop the assembly process, but not a new replacement model. The three special versions are individualized primarily by the color chosed for the bodywork.